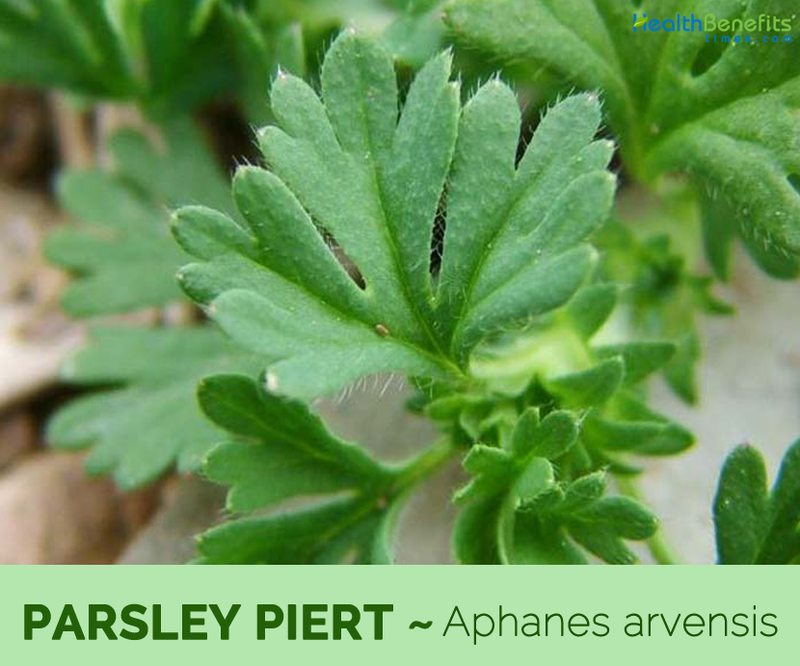 Parsley piert scientifically known as Aphanes arvensis is a tiny plant that can be easily overlooked in its wild habitat, as it grows only to around four inches high. 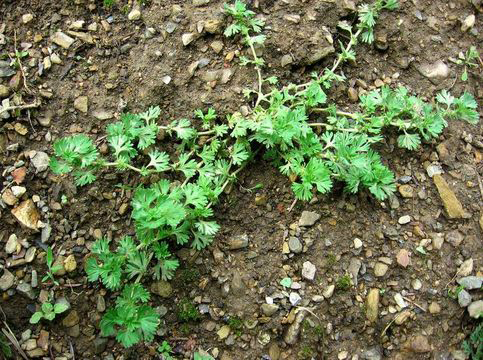 It is also known as Field Parsley Piert, Parsley Piercestone, Field Lady’s Mantle, Alchemilla arvensis Scop, Field Lady’s Mantle, Parsley Breakstone and Aphanes arvensis. The plant is a member of Rosaceae or rose family of plants and is also related to the soft fruit, plums, peaches, apricots, loquats, sloes, quinces, blackberries, strawberries, raspberries as well as to almonds, apples, pears, the dog rose and a whole host of other plants. The plant is native to Europe, North Africa and western Asia and has been introduced to North America. 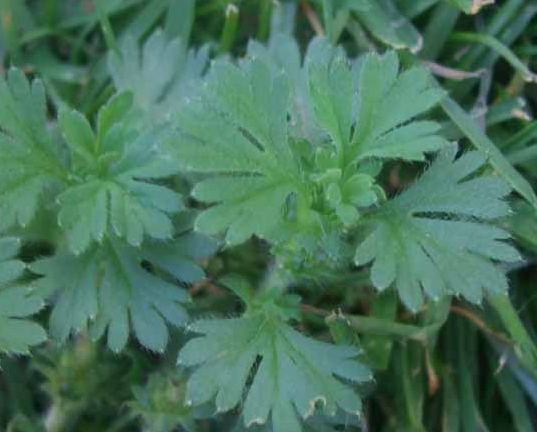 It is no relation to true parsley, but its leaves look similar. It is a close relation to Lady’s Mantle, hence the name Lady’s Field Mantle. It is also called Parsley Break-stone, from its efficacy in dissolving stone in the bladder. The genus name of Aphanes comes from a Greek word meaning unseen or unnoticed, which just describes this tiny plant. 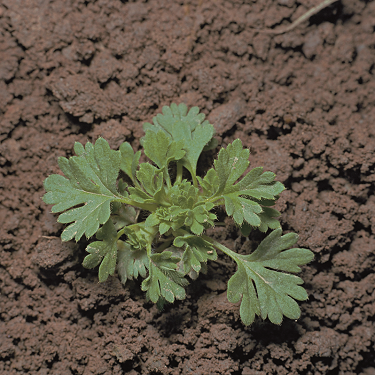 However, parsley piert is a very common and widespread weed of cultivated ground, whether acidic or not. Parsley Piert is an herbal medicine used to treat kidney stones, infections, and to help soothe and heal cuts and scratches. It may also soothe the linings of the kidneys and intestines and act as a diuretic (increases water loss). 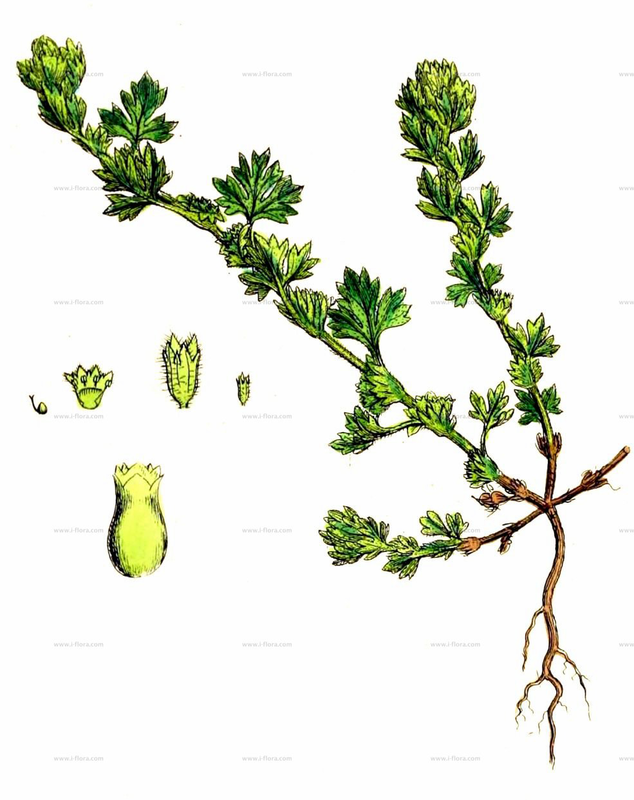 Parsley piert is a free branched, sprawling, downy plant that grows about 2 to 30 cm long and are dull green in color. 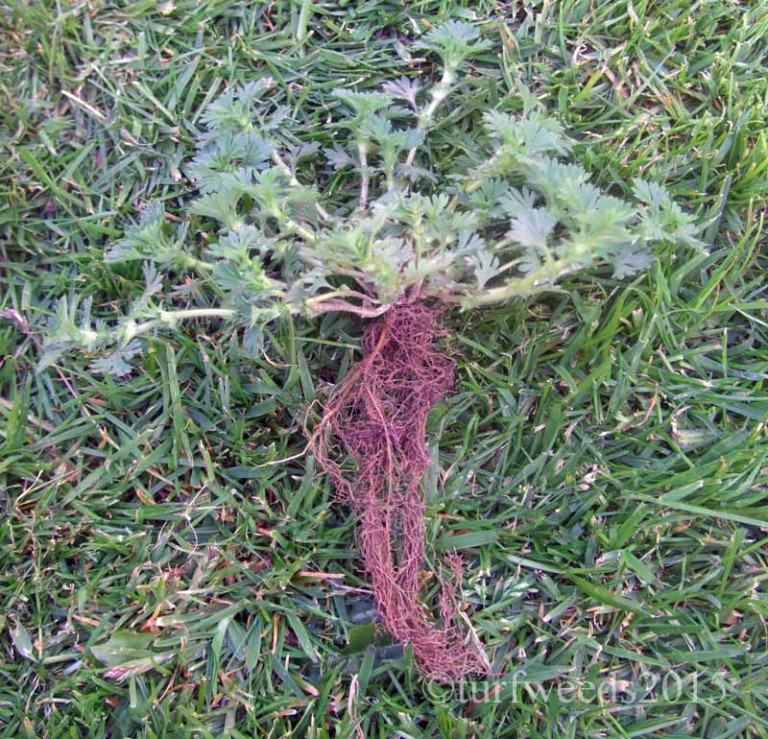 The plant is found growing in residential and institutional lawns, athletic fields, sod farms, golf course fairways and roughs, roadsides, utility right-of-ways, railways, and industrial areas. Normally it prefers well-drained soil and can grow in nutritionally poor soil. It can also grow in very acid and very alkaline soils. Root is thin, branched and fusiform and stem is generally branched and decumbent, with short internodes. Sometimes prostrate, but generally erect, and much branched from the base. 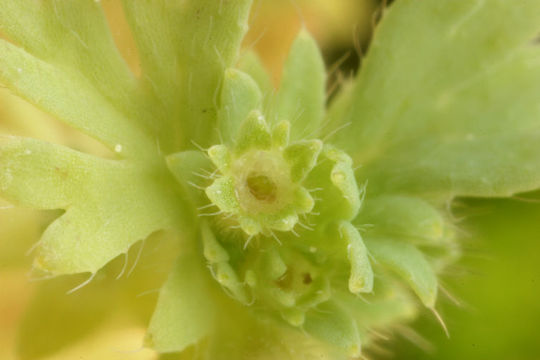 Leaves are dusky green color, wedge-shaped, three-cleft, the lobes deeply cut, the whole leaf less than 1/2 inch wide, narrowed into a short foot-stalk with leafy, palmately-cut stipules, sheathing and cleaving to the footstalk. The whole plant is downy with slender, scattered hairs. Leaves are only 2–10 mm long. The flowers are in axillary clusters of 10 to 20. They are surrounded by stipules. Sepals are erect, acuminate-ovate and pubescent on the outside and on the margins. They are glabrous on the inside and draw together when the fruit ripens. Flowering normally takes place from Jul to November. 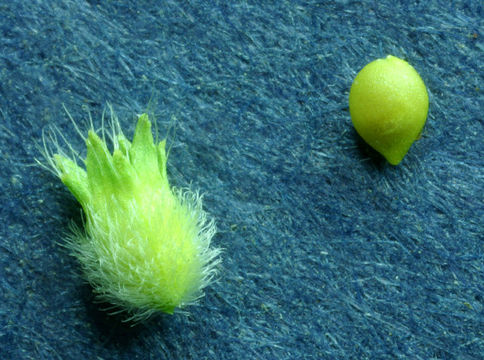 Fruit is 1 mm long, ovate, keeled, flat and jug-shaped. The calyx is vertically wrinkled and pubescent. 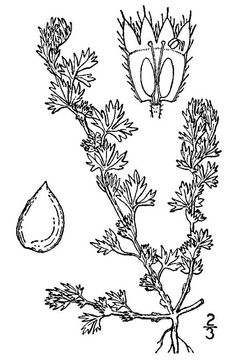 Parsley piert has a long history of folk use, being commonly employed to rid the body of stones in the kidney or bladder. It has become a highly respected herb in modern herbalism for the treatment of kidney stones. Whole herb is astringent, demulcent, diuretic and refrigerant. 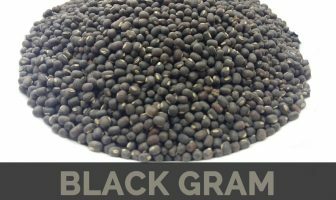 It is used mainly as an infusion in the treatment of kidney and bladder complaints (including cystitis and recurrent urinary infections), jaundice etc. Kidney stones can be treated by administering a combo of Stone root, Parsley Piert, Gravel root, Parietaria judaica, Hydrangea. It is used in folk remedies in the treatment of urinary tract disorders. It is beneficial in all cases of painful urination. It may be used where there is water retention, particularly where this is due to kidney or liver problems. People take parsley piert for fever, kidney stones, bladder stones, and fluid retention. Leaves are eaten raw in salads or pickled for winter use. The plant is rarely eaten nowadays. Tea: The recommended dose is 3-4 cups a day. Tincture: The recommended dose is 2-4ml, 3 times a day. Liquid extract: The recommended dose is 2-4ml orally, 3 times a day. 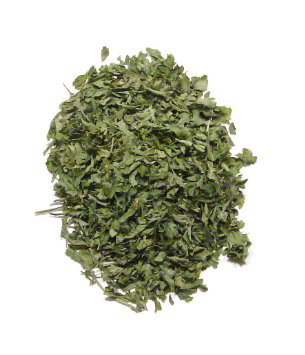 Dried herb: The recommended dose is 2-4mg orally. Parsley-piert may cause side effects, such as Breathing problems, Tightness in your throat or chest, Chest pain and Skin hives, rash, or itchy or swollen skin. Call your health care practitioner if you experience unusual symptoms while using parsley piert. Combining herbs with certain drugs may alter their action or produce unwanted side effects. You shouldn’t use this herb until you know more about its safety and effectiveness. Soil Prefers well-drained soil and can grow in nutritionally poor soil. It can also grow in very acid and very alkaline soils. Flower Flowers are in axillary clusters of 10 to 20. They are encircled by stipules. The sepals are erect, acuminate-ovate and pubescent on the outside and on the margins. They are glabrous on the inside and draw together when the fruit ripens. Fruit Fruit is 1 mm long, ovate, keeled, flat and jug-shaped. The calyx is vertically wrinkled and pubescent. Aphanes occidentalis (Nutt. ex Torr. & A.Gray) Rydb.